Minster’s Ivy Wolf applies pressure against Ottoville’s Kasey Knippen during Saturday’s game at Minster. 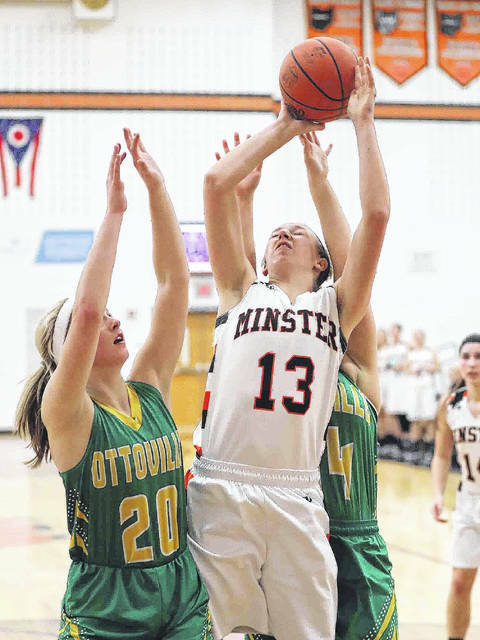 Minster’s Courtney Prenger puts up a shot against Ottoville’s Bridget Landin during Saturday’s game at Minster. 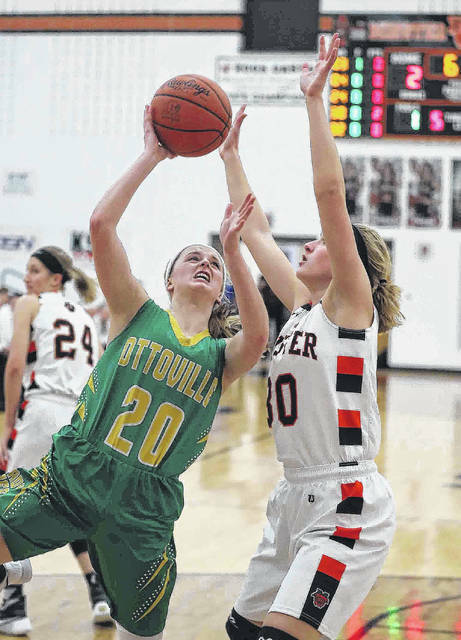 Ottoville’s Quinley Schlagbaum puts up a shot against Minster’s Courtney Prenger during Saturday’s game at Minster. Minster’s Paige Thobe puts up a shot againstr Ottoville’s Quinley Schlagbaum, left, and Abi Hilvers (right) during Saturday’s game at Minster. Ottoville’s Bridget Landin drives against Minster’s Taylor Koegge during Saturday’s game at Minster. 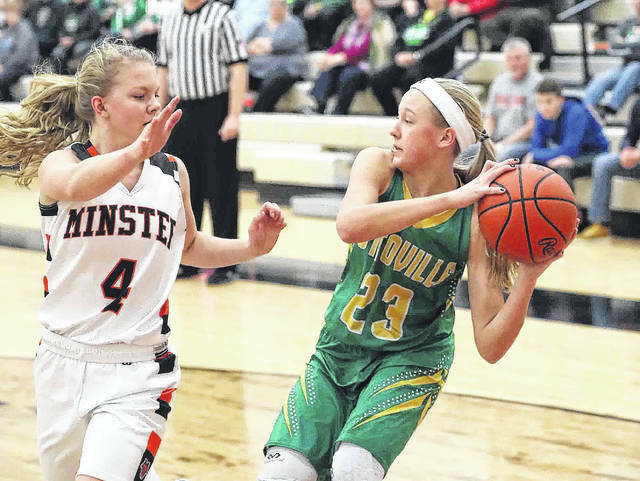 MINSTER — Big time players produce in big games and Minster’s Courtney Prenger proved that in the Wildcats’ 55-54 victory against No. 3 Ottoville in a non league affair Saturday. Down 45-38 win a little more than five minutes left in the game, Minster, ranked No. 1 in the state in Division IV, was in need of an offensive lift not only to catch the Big Green but to stem Ottoville’s momentum and they got that when Prenger highlighted a 7-0 run to tie the game after she scored five of the seven points to knot the game at 47. For the next two minutes the two talented teams traded buckets and with 45 seconds left Ottoville held 52-51 lead. But Prenger, who scored 11 of her game high 22 points in the final minute, hit another clutch basket to put Minster on top and after a miss by Ottoville on its possession, the Wildcats raced down the court and Taylor Kogge laid one in to make it 55-52 with 24 seconds left to help secure the victory. 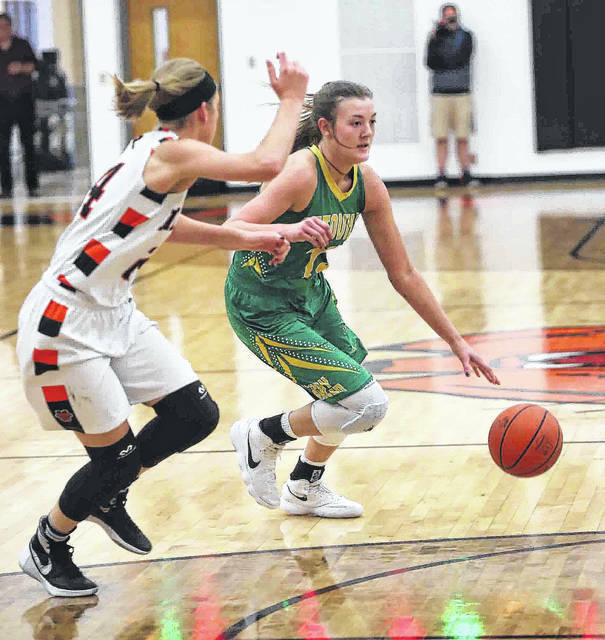 “You give the ball to your go-to player right now,” said Minster head coach Mike Wiss said about Prenger, a junior, coming up huge during crunch time. With the win Minster improves to 14-1 and Ottoville suffers its first loss of the year and falls to 15-1. Kleman added that this was a hard-fought game against two quality opponents and despite its physical play, both teams exemplified sportsmanship. Minster head coach Mike Wiss praised Prenger’s effort but also said the bench had a lot to do with getting the win. Wiss pointed to the efforts of Danielle Barhorst, Paige Thobe, Karly Richard, Jessica Falk and Kendra Thien. Minster’s Ivy Wolf finished with 15 points. Kleman said despite the loss the team did a great job against one of the best team’s in the state. 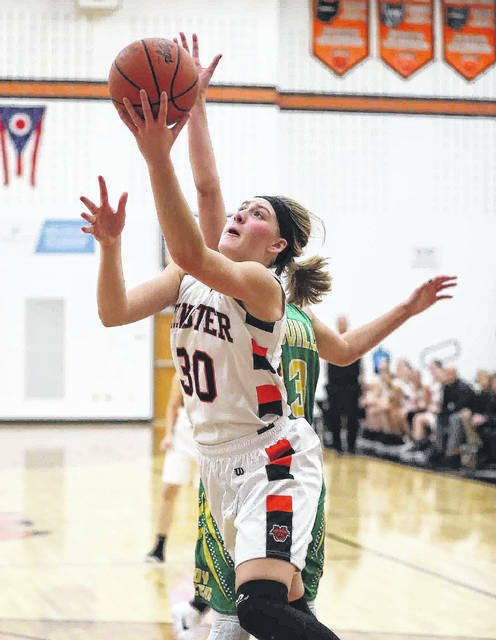 Minster’s defense did a great job of neutralizing Bridgit Landin, who scored nine points, but Cassandra Kemper and Kasey Knippen stepped up offensively and combined for 37 points with Knippen pumping in 20 and Kemper scoring 17. Landin may not have scored in double-digits but she was a force on the boards with 12 rebounds, and she also notched three blocks. Kleman said he hopes this game acts as a springboard for the final third of the season. This entry was tagged Minster, ottoville. Bookmark the permalink.